There were only 3,900 housing units advertised for sale in Dublin during July. RESIDENTIAL PROPERTY PRICES are increasing at the fastest pace in three years as the stock of properties available for sale nationwide hit a new “critical low”. According to the CSO Residential Property Price Index, prices across Ireland increased by 12.3% in the 12 months to July. The 3% rise since June was the largest monthly jump in prices for three years. 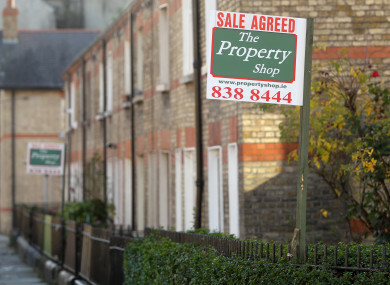 Since last July, the price of residential property in Dublin has soared by 12.7%. The price of a house is up 12.6%, while the cost of an apartment in the capital has increased by 12%. Residential property prices in the rest of the country, excluding Dublin, were 11.7% higher in the year to July. The fastest rise in house prices was in the west of Ireland, where prices were up 15.8%, while the slowest rate of growth was in the mid-west region, where costs were up 8.2%. Compared to the trough in early 2013, property prices nationwide have increased by 60.5%. Over the past four years, residential property prices in the capital have increased by 77.4%, while property prices in all of Ireland when Dublin is excluded are 51.2% higher. Last week, a Davy research note indicated that housing demand could be as high as 50,000 new units per year until 2021. Meanwhile, analysis published today by Sherry FitzGerald said that the stock of properties on the market is now “critically low in all urban areas”. Research by the real estate agent showed that property advertised for sale has fallen by 9% nationwide in the 12 months to July 2017. There are now 25,100 housing units available for sale in Ireland, which is little more than half the number advertised for sale in July 2010. “Such low stock will inevitably put increased upward pressure on prices,” said Sherry FitzGerald chief economist Marian Finnegan. Each of Dublin’s four local authorities, and commuter counties such as Meath, Kildare and Wicklow, have experienced a drop in supply since July 2016. The largest decrease was in Dublin city, where supply fell by 19%. There were 3,900 units advertised for sale in Dublin in July 2017, compared to 4,500 a year earlier. There was a similar trend in regional hubs such as Galway, Cork and Limerick. The number of homes on the market dropped in all three of the cities. Less than 1% of the total private housing stock in both Cork and Galway cities is available for sale, which translates to 271 units in Galway city and 451 in Cork city. Earlier this year, the National Competitiveness Council warned that soaring property prices pose a “significant threat” to the country’s economy. The organisation said that it was “especially concerned” by the dramatic increase in residential rents, noting that prices in some locations have exceeded boom-time levels. The council also warned that this could have “significant adverse consequences” for the entire economy. Email “Property prices are rising at the fastest pace in three years as supply hits a 'critical low'”. Feedback on “Property prices are rising at the fastest pace in three years as supply hits a 'critical low'”.